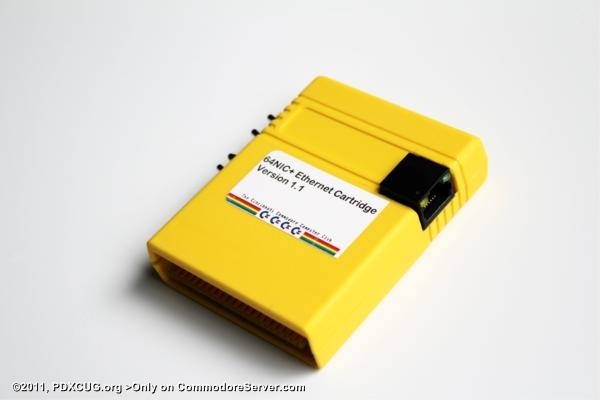 The 64NIC+ is an RR-Net Compatible Ethernet / Internet device which plugs into the cartridge port. It also contains a socket for an EPROM where you can place up to 16 different ROM images, up to 16K each. The cartridge was designed by Jim Brain for the Cincinnati Commodore Computer Club. @Tayger, you can use ChatteRR-Box software right now with the 64NIC+ and other RR-NET devices, but there is not currently a driver to allow the disk access like you can with user port devices. The Comet64 is unavailable at this time but there are other user port devices out there. Hello Can I use this module with commodoreserver? Is there default software installed that allows me to connect to the Internet? I wanted to buy commodoreserver's modem but it's neither available atm nor do I get any answer by my mails. Is it possible to buy a cartridge like this ?